MSM765zl controller has its ports facing the internal Switch Fabric of 5400zl and 8200zl Chassis Switchs. If MSM765zl is installed, for instance, on slot “D”, the Slot 1 is “d1” CLI-wise and Slot 2 is “d2” CLI-wise. Since ports are permanently connected, to simulate disconnecting a port disable the port. 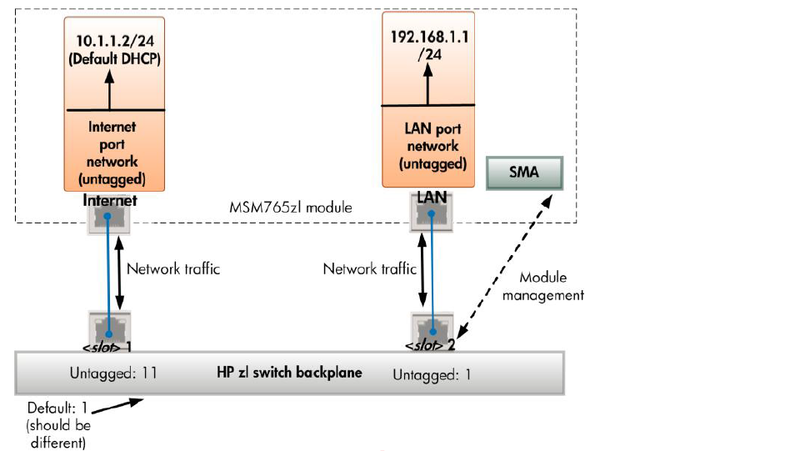 Note: LAN Port should not be disabled on the MSM765zl Controller, since it carries Services Managent Agent (SMA) communications between the Controller and the switch, which delivers the clock to the controller. If you plan to only use the Internet port, then you can assign slot 2 port an unused VLAN ID untagged. Next Post Wondering about the differences between HP AP’s MSM460 and MSM466?